After traveling from Baguio City, you will arrive at the bus terminal Partas located in Vigan. You are riding in a bus that actually have a final destination in the Loang City. 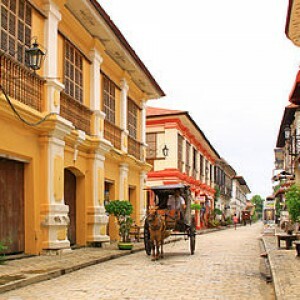 Vigan is an old relic of colonial Spanish town that was founded in 1572. Vigan name actually comes from the word “Bigan” for Spain spelling, whereas in the Philippines the spelling “Vigan”. Vigan is an old city that is still preserved intact and relatively safe during World War II when underway. 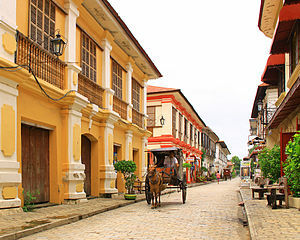 Vigan City is currently the center of the city of Ilocos Sur, located 408 miles north of Manila. The authenticity of the relics of the old buildings of the past are still maintained until now to make Vigan has been named as one of the World Heritage by UNESCO. So tourists walk around the Old City of Vigan, classic feel so thick felt. The old building with a classic and unique ornaments are in the right and left of the narrow streets made of brick granite, coupled with unique lights still dim lit in the morning will make you go back in time. The sound of footsteps passing horses from calessa between classical building will add a classic atmosphere becomes more dynamic. For those of you who love the art of photography, old building stands firmly in Vigan object which can be quite good and highly recommended. Some old buildings here much left as is, there is functioned as a museum, restaurants, hotels, and souvenir shops. At the end of the road there is a fairly large university building, the building is called the Divine Word College of Vigan. The university occupies an old building very large and sturdy, this building is a former congressional buildings that stood since 1930. In addition to the university there is an old cathedral which was also named as a World Heritage by UNESCO. Across the street, located in the southern most complex is the old town, stands the City Hall which is still used as a government building. The charm of a romantic evening, charming, and quiet will make you more comfortable exploring the old town. Modern side visible on the main road that connects the city of Vigan City to Loang and Manila. Seen shopping centers, offices, and restaurants along the main road is impassable. If you already feel quite satisfied with this city, you can go on a sightseeing trip to Pagudpud. Many buses that led to Loang, you can take a bus from the main road in the city. trip to Loang needs about three hours, the bus fare is 90 pesos. Loang is the center of the city of Ilocos Norte province. This city is more crowded conditions when compared to Vigan, with an area roughly equal to Baguio. Having arrived in the City Loang, you can take a tricycle to move to the bus which will go to Pagudpud. The journey of Loang heading to Pagudpud about two hours, at a rate of 70 pesos.